Belarus has been called a transit country for good reason.Since ancient times the road connecting Europe and Russia has run right through its middle. Here, on Belarusian land, the Tatar-Mongol hordes were stopped in their tracks on their way to Central Europe. Most invaders — Napoleon Bonaparte and Adolf Hitler among them — suffered their final defeat here. And all of them have passed through Minsk. Destroyed several times, Minsk is forever being reborn like a phoenix from the ashes, each time with a totally new appearance. 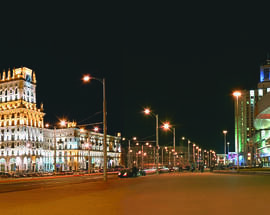 In Soviet times Minsk became the gateway to Stalin’s vast empire, an idea reflected in the city's contemporary architecture and urban design. 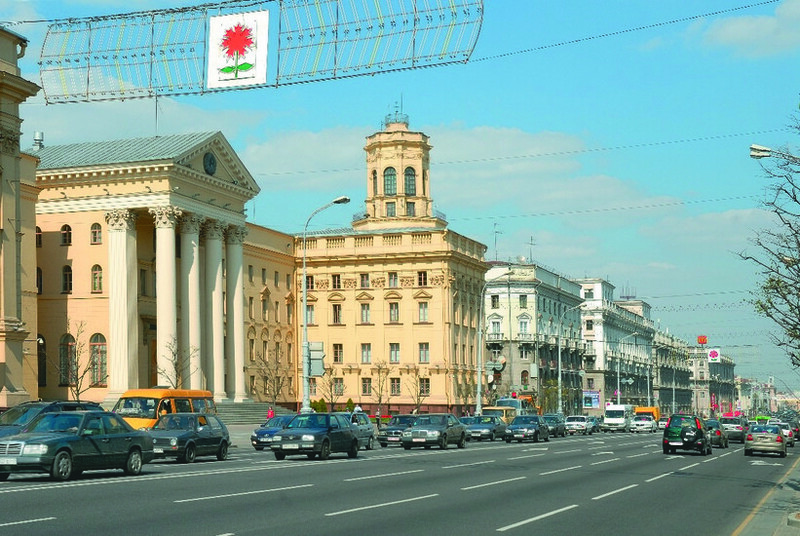 The city's main street, of which the central segment is known as Nezavisimosti (Independence) Avenue, forms part of the Brest–Minsk–Moscow highway. The city's main attractions are threaded along it or all easily found within its grasp. 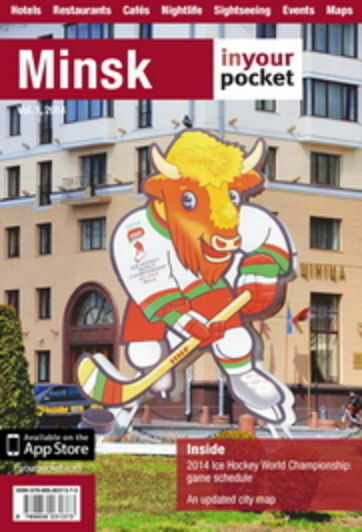 Strolling its length is as good a way as any to understand how today's Minsk really ticks. Back in 1952, Privokzalnaya Square (Railway Station Square) was referred to as the 'main lobby (or antechamber) of the capital' by M. Osmolovsky, one of the creators of the massive restoration project to rebuild a war-ravaged, almost completely destroyed Minsk. Right after you exit the glass doors of the city's new Central Train Station, straight in front of you on the other side of the square is the so-called Minsk Gate, two vast 1950s housing complexes complete with towers, the work of architects B. Rubanenko, L. Golubovsky and A. Korabelnikov and topped by four Socialist Realist sculptures representing the Warrior, the Partisan, the Peasant woman and the Engineer. 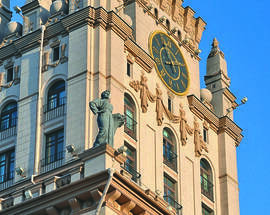 In one of the twin towers, at Kirov Street 1, a huge 3.5-metre clock (one of the largest in the country) is mounted. After navigating the underpass and entering the city through its 'gate', continue along Kirova Street and in a little more than five minutes you will find yourself in the shadows spread by the trees of Mikhailovsky Park. 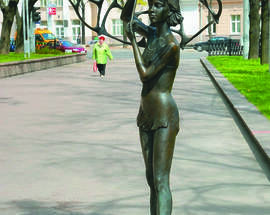 The park is decorated with a series of sculptures cast in bronze and representing miscellaneous urban characters. The work of sculptor V. Zhbanov and completed between 1998 and 2000, the life-size monuments are there to be touched and photographed. In the late 1990s a series of sculptures such as these began to spring up all over the city. Eschewing the former pompous practice of placing historical figures on pedestals, these new works of art live 'on an equal footing' with their audience. Those who prefer their public art the old fashion way however, fear not, for a classic Socialist Realist monument to Lenin complete with imposing pedestal can be found nearby at Nezavisimosti (Independence) Square, a square that also bore Vladimir Ilyich's name before 1991. 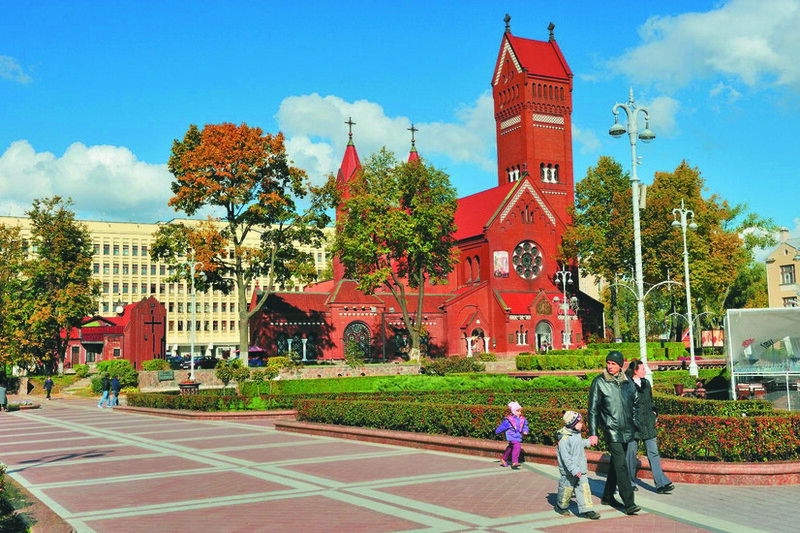 Around Nezavisimosti Square are to be found the most important buildings and institutions of national importance including the main building of the Belarusian State, the building of the Minsk City Council (also topped by a tower containing a giant clock! 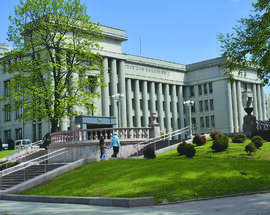 ), corps of Engineers of the Minsk Metro and the buildings of the Belarusian State University and State Pedagogical University. 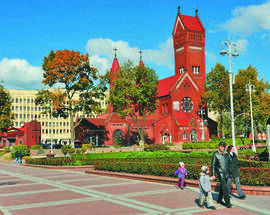 The red brick Church of Sts. Simon & Helena and the two houses to the right of it offer a rare reminder of pre-revolutionary Minsk. 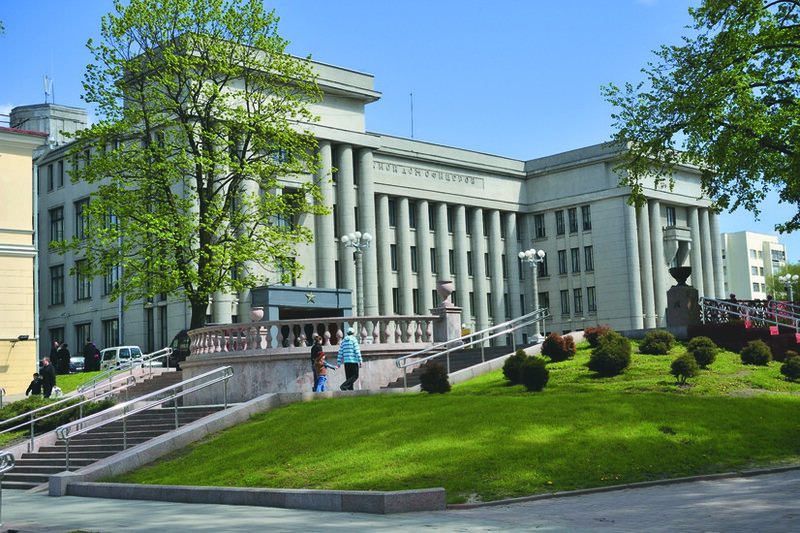 The dominant feature of the area however is the grandiose House of Government (architect I. Langbard, 1935), a textbook example of the achievements of Soviet urban planning of the 1930s. Here visitors to the city can really feel the elements that make the city so special and unique. Minsk was the embodiment of a project extremely rare in world practice, name that building an ideal city of the Great Communist Utopia. Minsk reflects the grandiosity of the dreams of a bright communist future and of a Paradise on Earth in the scale of the House of Government, the first of four iconic buildings mentioned here by the architect I. Langbard (the other three, as we'll see further along the tour, being the former House of the Red Army (now the House of Officers), the National Opera & Ballet Theatre and the National Academy of Sciences of Belarus). 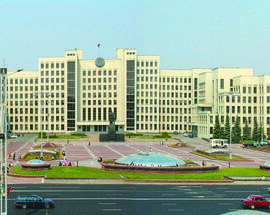 The House of Government remains one of the largest public buildings in Belarus. Nezavisimosti Square 'matured' to its current size (a whopping seven hectares and one of the largest squares in Europe) in 1964 when it acquired its present-day rectangular shape. It was again modified at the start of the 21st century with the addition of a new subterranean shopping centre. The wide and majestic Nezavisimosti Avenue starts its journey here like a river flowing from its source, a full 17 km in distance. 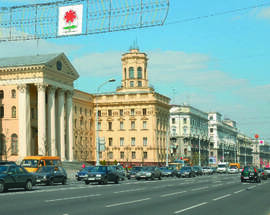 After examining Privokzalnaya Square and Nezavisimosti Square, which can be regarded as a prelude to — or more precisely an operatic overture to — the Avenue, we recommend a walk along its so-called central part as far as Oktyabrskaya (October) Square. All along this leg of the journey you'll see a number of grand buildings, each of them implicated in a series of urban myths and real stories that exist predominantly in the oral tradition. The Post Office (A. Dukhan, V. King, 1949–1953) is on the right 'shore' of the river-avenue. 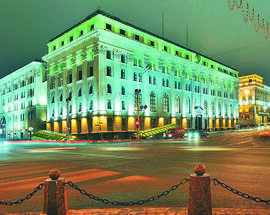 Immediately in front is the Minsk hotel (G. Sysoev, S. Musinsky, D. Kudryavtsev, 1957–1967). Further along on the left at number 17 is the tower on top of the right-hand wing of the monumental building of the KGB, the State Security Committee of Belarus (M. Parusnikov, G. Badanov, 1945–1948). 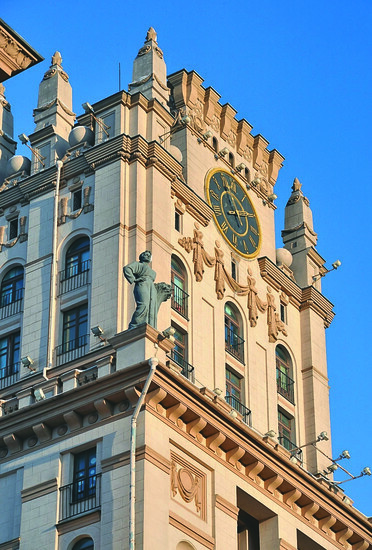 Known in the vernacular as Tsanava’s Pinnacle after the former Stalin-era chief of the Belarusian KGB Lavrentiy Fomich Tsanava, the tower, which was built on a whim and that never appeared in the original architects' drawings, is a popular feature in many informal tours of the city. The story goes that when the building's designs were ready, the head of the department of architecture Vladimir Korol went in person to show them to his client. Tsanava meticulously questioned the architect about why the building should have just four columns and whether just one person could open its massive front door. Pointing at the plans with a pencil, Tsanava continued, “And here, my friend, should be the pinnacle.” To which a timid Korol replied, “But it's impossible, Comrade Tsanava. If we build it, there should be two towers. The project is subject to the laws of symmetry.” “You know what, Comrade Korol,” continued Tsanava, “in Belarus everything is subject to the same law. And this isn't a law of symmetry, it's the law of Tsanava! Make sure the tower turns out beautiful.” With these words the chief KGB officer let the chief architect go. 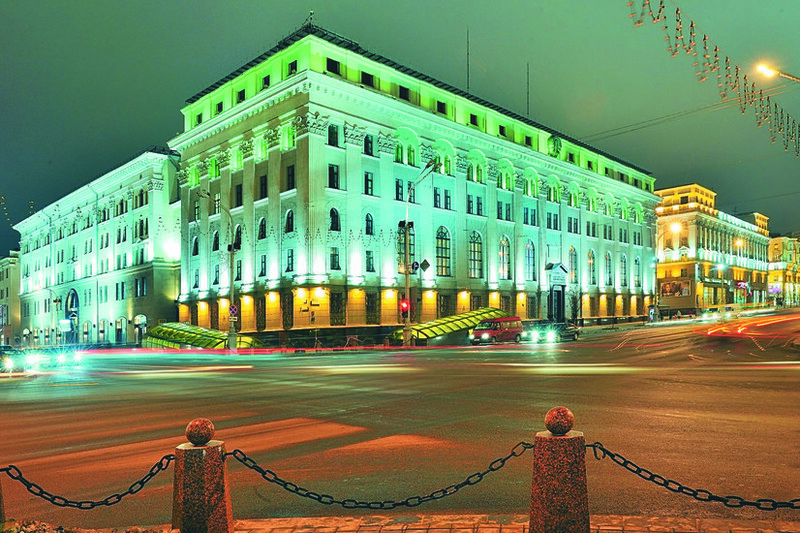 Approaching Oktyabrskaya (October) Square is the impressive National Bank of Belarus (M. Parusnikov, 1947–1952), a building combining both Classical and Renaissance elements. 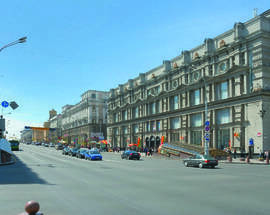 Opposite is GUM (R. Gegart and L. Melegi), the State Department Store which is also worth a visit. The store was opened (the old one was badly damaged during the war) on November 5, 1951. The interior was a veritable palace of precious woods, panels of polished oak, silk curtains on the windows, mirrors, cast bronze ornaments and even machines that sprayed cologne. Many of these items, considered the height of chic at the time, remain to this day. 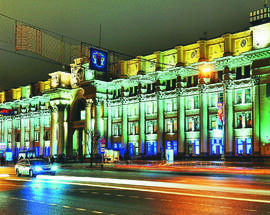 In 1969, GUM became one of the first stores in the Soviet Union to adopt the self-service method. 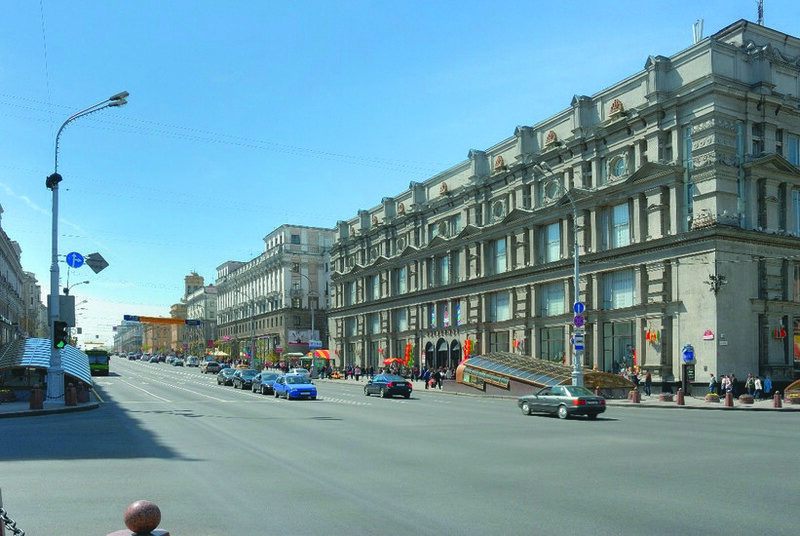 There’s one more building on the left worth further examination before reaching Oktyabrskaya Square, the deli and grocery store Tsentralny (Central). Don't miss the opportunity. Find a cafeteria on the first floor and enjoy the beautiful painted reliefs depicting the abundant happiness of a socialist paradise. To the right of Oktyabrskaya Square are the crowns of the oldest trees in the city in Alexander Park, with the remarkable sculpture Boy with a Swan (by the Italian sculptor L. Bernini, 1874). 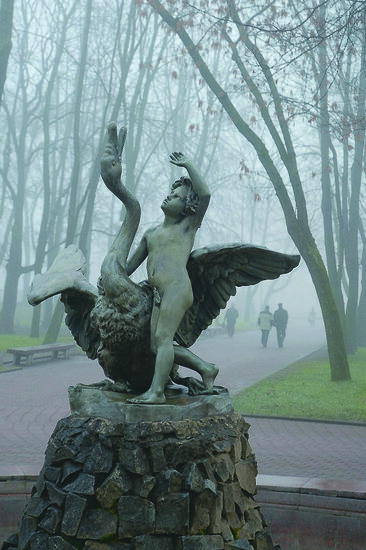 The boy and his swan remind Minsk of the 19th century, and together they not only survived the revolution and war, but also outlasted a monument to Stalin which stood in front of them across the avenue between 1952 and 1961. It's said that post-war fate of the almost completely destroyed Belarusian capital was decided by Stalin after a cursory glance as he passed through the city on his personal train on the way to the Potsdam conference. It was here, in the middle of this square, that there was a monument to him, Father of the Peoples, a vast 17-metre likeness that was one of the largest of him throughout the entire USSR and far bigger than the one of Lenin mentioned earlier. The monument was finally demolished in 1961 following Nikita Khrushchev’s secret denouncement of Stalin at the 20th Party Congress in 1956. The monument literally disappearing overnight, its final fate remains a mystery. The place where it once stood, right in front of the Palace of the Republic, is now where the city's annual New Year tree stands and where every December a large outdoor ice rink is poured straight onto the ground. 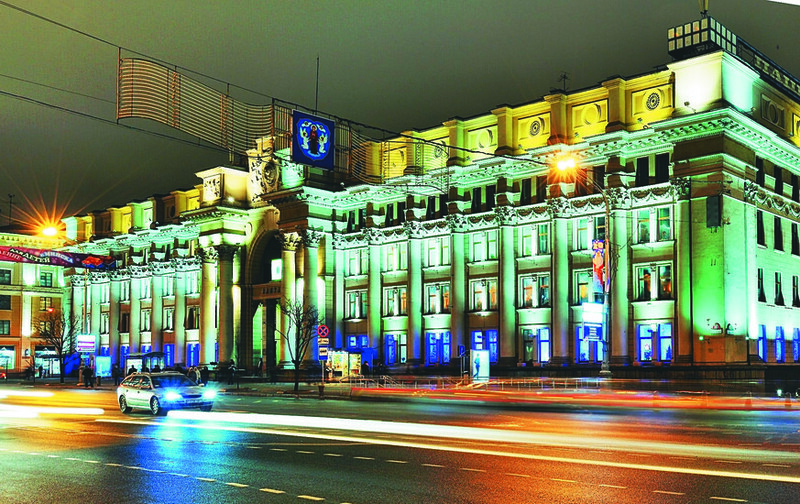 Before the construction of the Palace of the Republic, which was built in sporadic bursts between 1985 and 2001, the most notable building of the ensemble of Oktyabrskaya Square was the cathedral-like Palace of Culture of Trade Unions (L. Melegi, V. Ershov, L. Pavlov, M. Parusnikov, 1949–1954), built in a neo-Classical style and richly decorated with sculptures on the façade, its peasants and workers replacing the traditional angels. The square is bordered with granite parapets (E. Zaslavsky, 1957), platforms for the former communist leaders and bigwigs who oversaw the vast parades and demonstrations that the Soviet Union did so well. The façade of the House of Officers (I. Langbard, 1934–1939), which until 1946 was known as the House of the Red Army, faces the trees of Alexander Park. 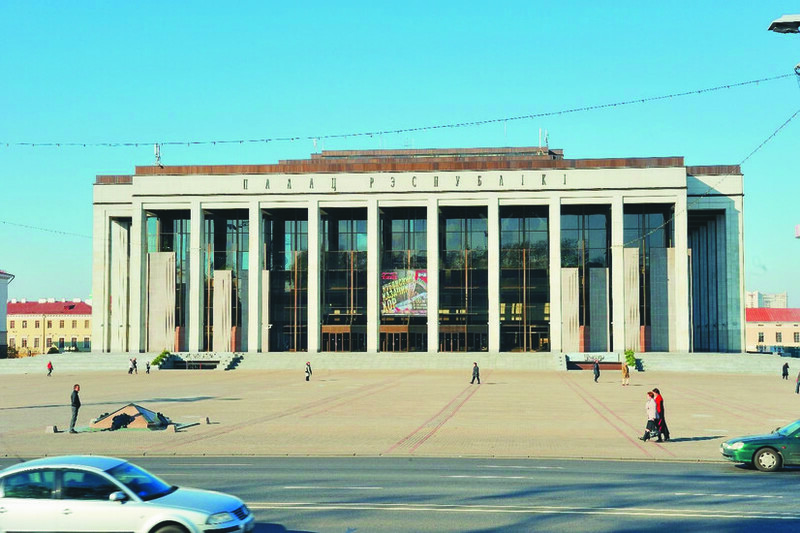 With its four above ground and four underground floors, 100 rooms and halls with a total area equal to three football pitches, the best stage equipment in the country and its first indoor swimming pool the building was at the time unique not only for pre-war Minsk but also for the Soviet Union. In terms of decoration the House of Officers surpassed even the House of Government. During the war most of the interior including paintings, chandeliers, furniture and even the seats in the theatre hall were taken to Germany by the occupying Nazi regime. After the war, the ruined House of Officers was restored to its former splendour and became the focus of social and cultural life in the city. 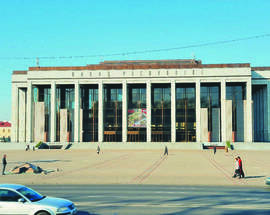 Within its walls all major public events were held, including Party Congresses, the première performances of the Belarusian Theatre and children's matinees. Here, on December 1, 1944, the second restaurant in the liberated city was opened. On the same side of the avenue are the Yanka Kupala Theatre, a former Municipal Theatre from the late 19th century and the Residence of the President of the Republic of Belarus, the former building of the Communist Party of Belarus (A. Voinov and V. Varaksin, 1941–1948). Begun in 1941, it survived the war and was completed after liberation. Almost exactly as it was, only the huge busts of Marx and Lenin that once graced its entrance like lions guarding the entrance to a Buddhist temple are missing. These can now be found inside the city's recommended Zair Azgur Museum, an extraordinary testament to the work of the country's leading sculptor of official monuments, the Vitebsk-born Zair Isaakovich Azgur (1908–1995).